OUTLAW RUN The Book 2012. Muscle Cars, Hot Rods, Rat Rods, Classic Cars & Trucks manufactured before 1976 are now banned from roadways across America. You cannot drive your cherished ride on any street in this country due to a legislative law passed making it illegal to do so. The law was passed on the back of another legislative law to eliminate environmental hazards. It's over! You can't drive your Street Rods and the Streets... period! If you get caught driving your classic on the road you will lose your license for 5 years, be heavily fined and forced to watch the local scrap yard destroy you vehicle by crushing it to a pulp. There are no appeals, no plea bargains and no way so save your pride and joy. One man says, "The hell with this! I'm taking my GTO out for a cruise and they gotta catch me to stop me!" 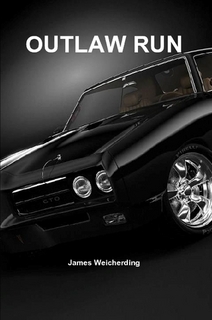 The drag race is on and the action-packed series takes hold and builds traction in this wild ride to escape the Law, The Feds and Anyone else who wants that reward money to stop this unleashed power plant, big block, jet black, 1969 GTO and its driver. "Buckle Up!" Because this is one helluva ride!